Thomas Henry Carter epitomized Southern privilege and pride. Scion of an old and wealthy Virginia family and related to several others, Carter received a top-flight medical education and then came home to manage the family's 1,200 acre King William County plantation and oversee its 100-plus slaves. He married well, made the plantation profitable, and enjoyed Tidewater's lively and convivial social life. Then the war came. When Virginia seceded, Carter committed his energy and talents to the service of his Commonwealth and the Confederacy. In May, 1861, he raised an artillery battery, rose from captain to colonel, and became one of the Army of Northern Virginia's senior artillerists. For four years, he fought along side some of the Confederacy's most prominent soldiers and candidly commented on their personalities in his letters to his wife and partner in all things, Susan. Graham Dozier has meticulously edited and compiled 100 of these poignantly written and highly insightful letters. Devoid of fire-eater rhetoric and political ideology, they give life to the myriad experiences Carter endured during the war in the Eastern theater. Through them, Dozier concludes, "Carter reveals himself to be a thoughtful observer of the people around him and of the events which he is a witness or participant." Carter's opinionated letters begin with his first posting near Fairfax Station on September 27, 1861. In quick succession, he concludes that Adjutant General Samuel Cooper "is an imbecile," and commanding General Joseph E. Johnston "is a man of splendid abilities& every inch a soldier but I take it he is lazy if I may judge from the want of system evinced on every side." Not all of Carter's observations were so critical. At the Battle of South Mountain on September 14, 1862, he comments on the conduct of Colonel John Brown Gordon. Carter maintains that Rode's Brigade would have been destroyed "but for the gallantry of Gordon who kept his Regt under perfect control when every other Regt broke & fled, marching it so skillfully under a terrible fire as to cover the retreat." But as the war dragged on, the pragmatic Carter realized the army and the Confederacy's political leadership were deteriorating. In October 1864, he described the inglorious aftermath of the Battle of Cedar Creek and the fate of the army's supply train at the hands of Union cavalry. "Although thousands of infantry marched on each side of the train in a disorganized state," he lamented, "none could be induced to offer resistance to the enemy." He likened the soldiers to a mob rather than an organized body of men. By the end of the year, Carter conceded that slaves needed to be conscripted into the army in order to save the Confederate nation. "The Yankees have used them successfully & so can we if their freedom is given them when conscribed -- or enlisted," he conceded. War's end found Carter with Lee's battered army at Appomattox Courthouse. His artillery helped clear the Lynchburg Stage Road on the morning of April 9 and success seemed at hand. But the arrival of Union infantry ended any hopes of the army escaping west. On April 12, he broke camp for the last time and headed home to an uncertain future. Carter struggled to maintain the plantation through the 1860s and 1870s, even starting a school to help defray expenses. In March 1877, fortune smiled on Tom Carter when the Virginia House of Delegates voted to appoint him the first railroad commissioner for the Commonwealth. He later relocated to Atlanta and served on the board of arbitration of the Southern Railway and Steamship Association. In 1897, Carter and his wife moved back to Virginia when he assumed the post of proctor at the University of Virginia. His life's partner, Susan, died in 1902 and Carter followed her six years later. Both are buried in Richmond's Hollywood Cemetery. 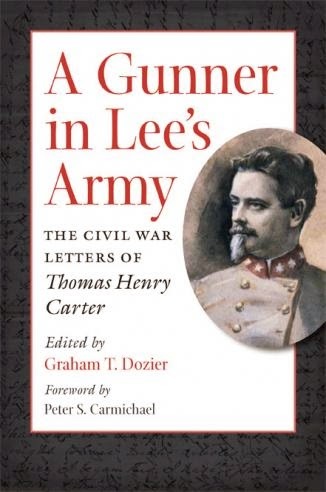 Carter never published a memoir of his Civil War service. His letters to his wife, therefore, served as a lasting testament to his service and his beliefs. With language every bit as eloquent as his subject's, Dozier's informative annotations put Carter's wartime experiences into context. Essays detailing Carter's early years and post-war activities provide substantive bookends to a life well lived.